What a great day for Geocaching - four for four! To take a rare peek inside the mysteries of this arcane pastime and see firsthand, some freshly caught caches, click here. Saint Lucia is one of the Windward Islands, first visited by Europeans in about 1500 and colonized successfully by France in 1660. Great Britain took control of the island from 1663 to 1667 and subsequently went to war with France an additional fourteen times before finally taking control in 1814. The island was a member of the Federation of the West Indies until 1979 when it became an independent state of the Commonwealth of Nations. 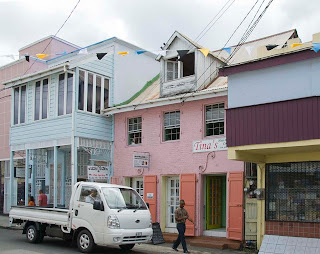 Castries is the capital city with a population around 60,000 and has been rebuilt a number of times, follow ing major fires in 1796 and 1813, and most notably on June 19, 1948. 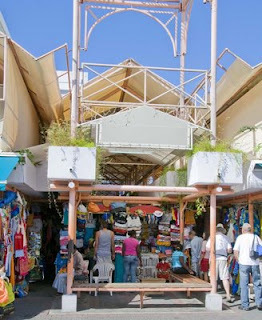 Derek Walcott Square, in the center of the city, is the location of The Basilica of the Immaculate Conception, the seat of the Archbishop of the Roman Catholic Archdiocese of Castries. At 200ft long by 100ft wide the cathedral is the largest church in the Caribbean. During WWII, a German U-boat snuck into Castries harbor and sank two allied ships. Check here to look around town. 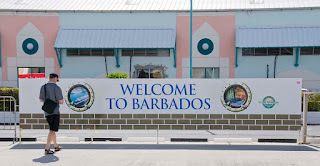 Strictly speaking, Barbados isn't even really part of the Caribbean, lying as it does in the extreme western Atlantic, just east of the Caribbean Sea. Perhaps it was for this reason, that our enthusiasm was at a low ebb, allowing us to easily rationalize ourselves out of consummating the visit downtown. The 94 degree, high humidity day, a lengthy walk from the ship to the customs house, a claustrophobic, body-filled enforced passage through a chicane of grotty jewelry and junk stores only to reach a plaza that was four miles away from downtown probably had a lot to do with it as well. The witless logistics at this point, was to transport the several thousand milling sightseers downtown in a series of 7 passenger minivans. Enough! We reversed course and spent a relaxing day in the air-conditioned comfort of the "big boat" putting on a few pounds, feeling smug and watching containers being shuffled hither and thither on the dockside. 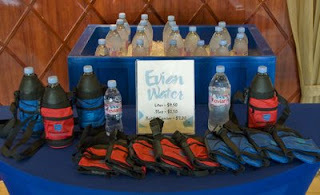 The shore-side drinking water, at $17.00 a gallon, seemed expensive even for Evian. Antigua is one of the West Indies islands which, in turn, are part of the Leeward Islands in the Caribbean sea. European discovery occurred in 1493 during the second voyage of Christopher Columbus but, due to the fierce Carib Indians resident at the time, no community was established until about 140 years later. It is the main island of the country of Antigua and Barbuda, with an area of about 108 square miles and a population around 70,000. 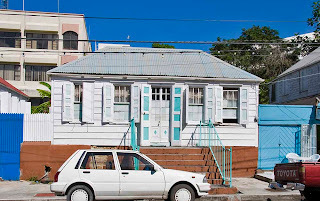 As well as being the largest of the Leeward Islands it is also the most prosperous, with an upscale tourism industry, offshore banking activities and a large internet gambling service that aggravates several other countries, including the US. M ost recently of course, Texas financier R. Allen Stanford has put paid to some of the prosperity of this little country by stealing $8 billion from sundry investors. Almost half of the population live in the capital city of St. John's and it was here that the ship parked. 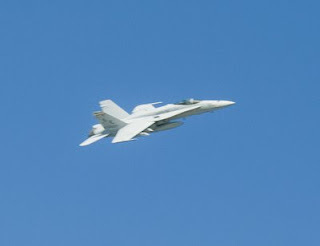 Check out some St. John scenes here. To get into Miami from the faraway "Everglades" campground meant running the gauntlet of the racetrack known as the Dixie Highway, which determined us to check out other noted highlights while we were in the area. Great! First up was Coconut Grove! In spite of numerous claims to fame (and probably as many to infamy), this Miami neighborhood simply didn't do it for us. Vaguely defined geographically and running the gamut from the City Hall housed in the original Pan American Airline seaplane operations building on Biscayne Bay to acres of run down city housing and all that that entails, the "Grove", also known as Miami's food court, turned out to be a brief stop. At least we escaped without being mugged! Coral Gables was our other target and this turned out to be a more enjoyable visit. 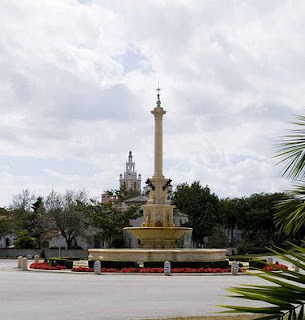 One of the earliest ever planned communities, and precursor both of the gated community and the homeowners association, Coral Gables remains notorious for its rigoous aesthetic regulations. 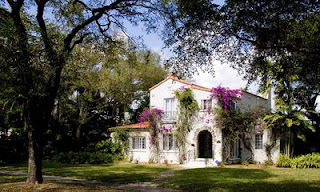 Developed by George Edgar Merrick during the Florida land boom of the 1920s, the city's architecture is predominantly Mediterranean Revival Style with a number of quirky exceptions. For example, there is a Chinese Village section, a couple of French sections and even a Dutch South African section among others. By 1926, the city covered about 15 square miles and currently stands at more than twice that area. Merrick designed the downtown commercial district to be only four blocks wide and more than two miles long including an exclusive shopping area known as the Miracle Mile. In 1925, the city was selected as the home to the University of Miami, which was constructed approximately two miles south of downtown Coral Gables. A rather authoritarian approach to casual country living perhaps, but property prices have certainly benefited from it. See more features here. 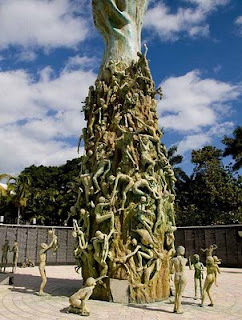 Until well after WWII, Miami Beach was strongly segregationist. 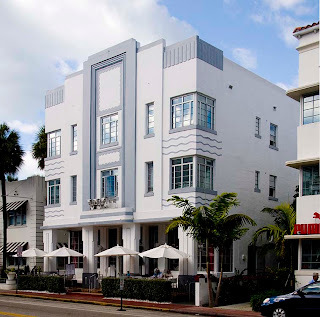 Known as the home of Good Millionaires as opposed to Palm Beach, the rallying point for Bad Millionaires, Miami Beach, in the '20s and '30s, attracted the likes of Harvey Firestone and J. C. Penney. WASP (White Anglo-Saxon Protestant) credentials were implicit prerequisites for acceptance anywhere above Fifth Street in addition to well established and massive wealth. 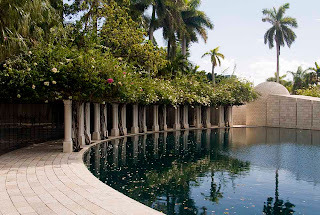 Well-to-do also-rans, seemingly, had to be satisfied with the relative rigors of life in Palm Beach. As late as 1949, "No Dogs, No Jews" signs were to be seen in hotels lobbies and other pseudo-public areas while real estate advertising included memorable phrase such as "All views, No Jews". In the case of black visitors to the city, up through the early '50s, a pass showing proof of employment was required, even to cross the bridge. Mysterious then, that this should be the site chosen for a major Holocaust Memorial. 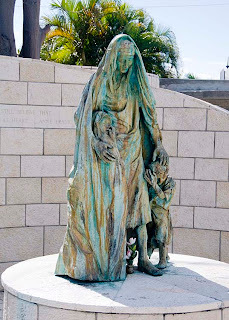 WWII was instrumental in initiating changes in Miami Beach. With a massive influx of military personnel, plant and equipment, along with attendant support systems, a blurring of established social boundaries began, culminating in a more cosmopolitan landscape by the mid-fifties. Since then, South Beach has endured several other near-death experiences but survived them all. Vanishing vacationers in the 1960s and '70s led to rapid decay and significant slumming down of the area. A group of worthy citizens successfully halted this disaster by forming the Art Deco District preservation effort and revitalized visitor enthusiasm. This effort, in turn, was almost nullified by the Mariel Boat Lift in the early '80s which resulted in 125,000 criminals, mental defectives, hookers and other assorted undesirables being imported into the area from Cuba. Nice one, Fidel. The TV show Miami Vice is credited by some to have helped lift the area's image again in the mid '80s, as South Beach became a hot area for edgy advertising shoots, music-videos and other Hollywood fare. Meanwhile, the Jewish community had flourished mightily. Dade County was now home to 11% of the nationwide American Jewish population who, in turn, made up 12% of the entire county population. 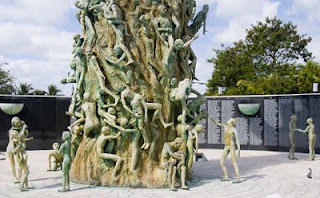 Thus it was, that a group of Holocaust survivors formed a committee in 1985 leading to the opening of the Memorial in 1990. The Memorial itself, has a curved walkway with a reflecting pool and a black granite wall from which a passage leads to a circular, walled plaza. 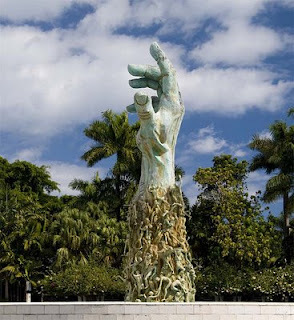 The centerpiece of the plaze is a 42-foot bronze arm reaching up out of the ground and decorated with about a hundred life-sized bronze figures, some climbing the arm, some scattered about the plaza. A touch too bizarre, for my simple mind, to evoke much response beyond "Huh?" But then, each to his own. In a little over 100 years Miami, Florida grew from 300 people to 5-1/2 million, earning it the title of The Magic City with snowbirders since it seemed to grow magically with each passing year. 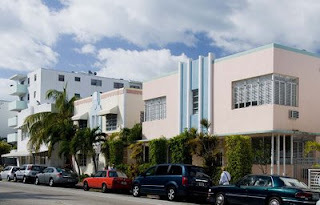 The place to live of course, is Miami Beach which is confined to the narrow strip of land running down the Atlantic side of the intra-coastal waterway. Miami proper however, has some claims to fame of its own. Now the 4th largest metropolitan area in the USA behind New York, Los Angeles and Chicago and the 3rd ranked skyline behind New York and Chicago, Miami has grown into a true southern metropolis. Officially designated a Global City, it effectively fills the area from the Atlantic coast to the everglades along a 40 mile north-south swath. 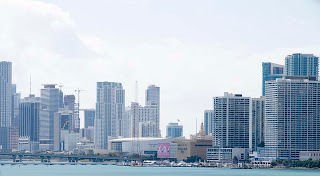 All that aside, downtown Miami is much like any other downtown and the suburbs are a sprawling melee of housing ranging from small, boxy post WWII homes to upscale additions with yuppie villas by the square mile. The only major US city to have been founded by a woman - Julia Tuttle, an early snowbird from Cleveland, incorporated the city in 1896 - its success assured when Ms. Tuttle convinced Henry Flagler to extend his railroad south to service the city. Scarily, the entire greater Miami area has a an elevation of just 6 feet above mean sea level. 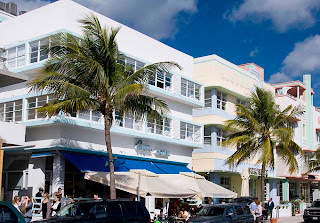 But, our objective was Miami Beach, across the intra-coastal to the southern end of the sandbar known as South Beach. Here is the largest assortment of Deco architecture in the world with almost every example maintained in pristine condition. Conjuring images of pastel colored cruise ships and Flash Gordon rocket ships, the Art Deco buildings, with their portholes, rounded walls, steely accents and geometric decorations, are simply awesome. The Art Deco form developed from the 1925 World’s Fair in Paris from a fusion of Art Nouveau and early twentieth century industrial modernism, although the term itself only came into use much later. If you like that sort of thing, click here. When Frank McCloud (played by Humprhey Bogart) alighted from the bus in Key Largo during the opening scene of the film of the same name, the Overseas Highway, as US 1 is known, had been operational for less than ten years. From the early 1910's until 1935, outside of a plane or a boat, Henry Flagler's Florida East Coast Railway was the only continuous route to Key West. The 1935 Labor Day hurricane put paid to this convenience in a heartbeat and it wasn't until 1939 or so that a continuous roadway was cobbled up from existing bridges and parts of the defunct railroad. This 127 mile, mainly two lane highway continues to have the highest accident rate per capita, in all of Florida. Altogether, there are about 1,700 islands in the Florida Keys archipelago, divided into the Upper, Middle and Lower keys. 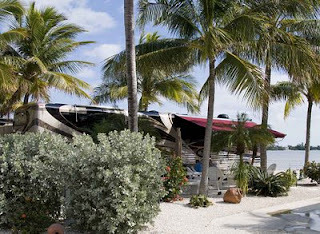 The Saddlebunch keys are a series of mangrove islands in the Lower keys, about 7 miles east of Key West and it is here, on a tiny finger of land, that the Bluewater RV resort is located. See here for more Bluewater views. This particular RV park has 81 total sites, all of which are owned by individuals and, at the time of our stay, almost 25% (20 sites) of these were available as resales - some at quite distressed price levels. So much for the keys - gone from our to-do list and is unlikely to make our do-again list. Lots of Florida tackiness with few offsetting benefits and, while lurking in the campground was both relaxing and comfortable, there was not more than two or three days of vigorous exploring within an hours drive. Been there, done that. Boca Chica Highway, County Road 941 used to run around the southern side of Boca Chica Key. 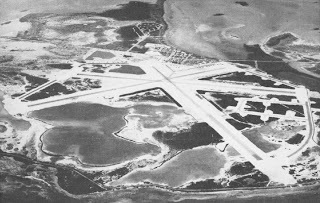 The NAS airfield that now dominates this key was initially constructed in 1940 and, as it has grew and took over the majority of island, the destination for CR 941 was absorbed into the base. 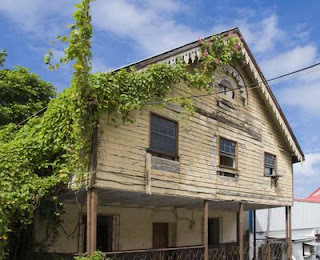 Except for the east end of the highway, that serves a surviving residential area, the road has been abandoned and much of it has been recovered by nature. Several miles of public right-of-way still run along the shoreline providing a rustic-junkyard quality of beach walk which, half a mile in, is posted "Warning - Clothing Optional Beach Ahead". It was here that we witnessed the true meaning of beach bum as we stumbled naiavely along while assorted buns, lurking in the undergrowth ahead of us, were hurriedly covered. Full story here. The Keys do not offer much in the way of shopping. No Wal-Mart, Sam's Club, Costco or elegant malls within 100 plus miles - just a few grocery stores, miles of tacky plazas, lots of bars and a smattering of restaurants. The upscale restaurants in Key West are more convenient than those in Miami a hundred and fifty miles away but are extraordinarily expensive. Such local offerings, at least those that we checked out, are far from stellar. 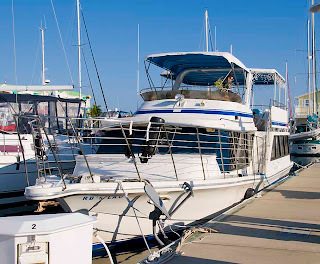 Ever optimistic, we decided on something different and perhaps, even a little romantic - a Dinner Cruise from which to enjoy a Key West sunset. What a tatty illusion this turned out to be. See sorry story here. The English guys, Dave and Lynn - they of cool cooking fame, have a Monaco Dynasty with the Nottingham floor plan. This was the actual coach that wooed us into changing out our Signature last year - all due to the Nottingham's great kitchen. Dave and Lynn sometimes travel with four or five people on board and had the kitchen modified to include an oven and a three burner stove top. An oven! What a joy. We haven't had an RV with an oven since 1991 and, apart from an incendiary episode with the convection microwave in our 2000 Country Coach, we had put roasts and baking on the road, out of our minds. Now, at the first opportunity we baked some bread and the oven worked like a charm. Next stop was to check out the convection microwave and - Guess what? - it worked like a charm. 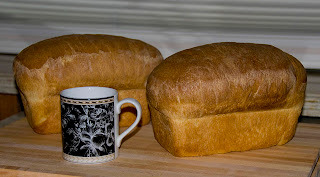 These loaves were baked on low-mix at 425 for 25 minutes and turned out just right! Brr - Just how far south must we go? As the weather got colder we kept driving south until there was no more south to go to and still it was cold! 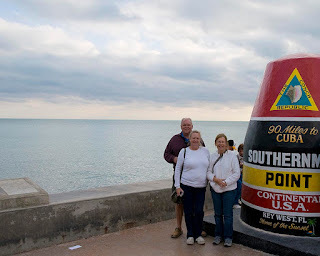 That, in a nutshell, is how we ended up huddled around the most southerly point in the lower 48 at the junction of Whitehead and South Streets in Key West, Florida. 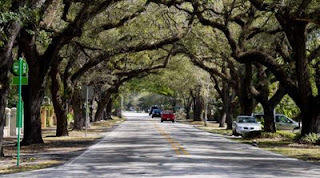 While the Keys have always been on our to-do list, the 600 mile journey from the Georgia border through the customary wintertime Florida hordes, coupled with our innate laziness, have always provided ample reason for not bothering. This year however, circumstances ganged up on us and, outside of blatant wimpishness, we simply ran out of excuses. First, we were already at Lazydays having our coach brutalized - a full 1/3rd of the way to the end of the world. Next, some English folk we had met last summer arrived at Lazydays about the same time having booked a site in the keys for a couple of months or so. Finally, with the economy at large holding the populace in some kind of suspended animation, snowbirds were looking like an endangered species and the f ormerly "packed" vacation sites were all replete with vacancies. 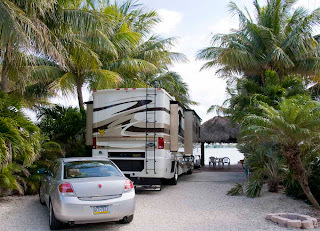 So, off to Bluwater Keys RV Resort it was! We greatly enjoyed a couple of weeks lazing around with the Brits, swapping tall tales of the Old Country and petting their adorable 140 pound dog Peppa. Better yet, they turned out to be accomplished meal meisters and we had more cooked meals in two weeks than we normally see in a year! 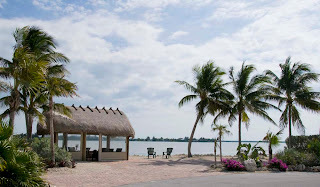 The Bluewater Keys site, chosen from England on a whim, was the best we encountered on the 120 mile ride along the string of mud-piles leading to Key West and, overall, the weather was 60 to 80 degrees warmer than Fort Wayne. All in all, a great trip. See memories of Key West here.